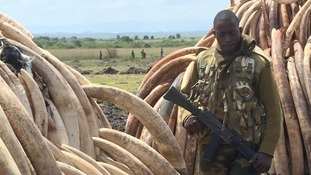 Tomorrow Kenya will burn more than 100 tonnes of ivory, most of it hacked off elephants butchered by poachers. It will be the biggest such burn in history and represents about 5% of the world’s ivory stockpiles and is a spectacular stunt designed to highlight the sheer size of the poaching crisis in Africa. Some African nations believe the ivory should be sold on a regulated basis, in a controlled way. A legal market in ivory, they argue, will kill the black market, wipe out the profits of the criminal gangs and save animals. However, others believe such legal sales will only drive demand. It is a debate that rages while the crisis worsens. A record number of elephants and rhino are being slaughtered in many parts of the world. In our series Stopping the Slaughter, Prince William recently warned that we have only 5-10 years to save the rhino, maybe 20 years to save the elephant. Now, the wildlife campaigner Joanna Lumley has had her say. She feels the only solution is to curb demand ,which means taking on the might of China and persuading the authorities there to fulfill their promise to ban ivory sales. She says it is now time to get tough and to link trade with China to an agreement by Beijing to ban the domestic market in ivory. It is a bold call. The harsh reality is that most Western nations would have more to lose from trade sanctions than the Chinese. It won't happen, but she is making her point in our interview today and she is making it powerfully. She has lobbied Chinese diplomats here in London and feels very strongly that the end to the crisis is in China’s hands. She also disagrees with Prince William, who told me a few weeks ago that trophy hunting was acceptable in very limited circumstances. Joanna says it is never acceptable. "If you want to take down a cheetah, try it with your bare hands and see how you get on."